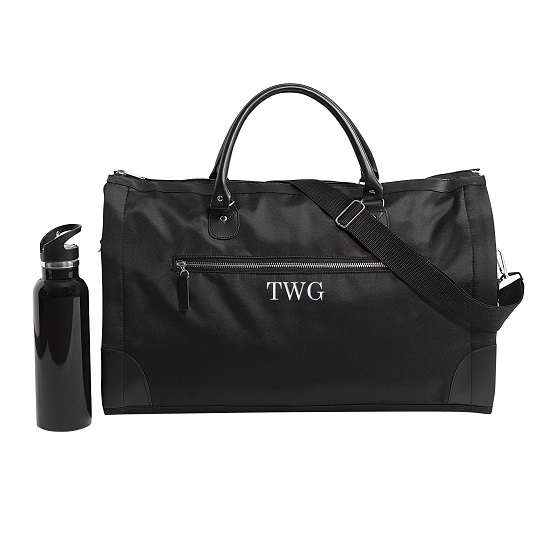 Travel the globe in style with the sleek Jetsetter. 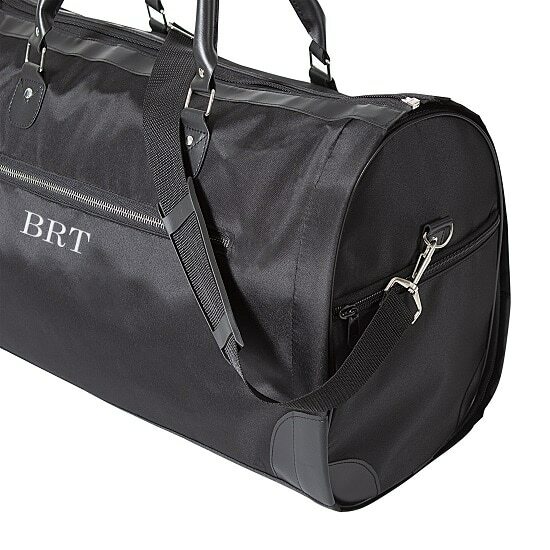 This black travel bag easily converts from a duffle to a hanging garment bag. 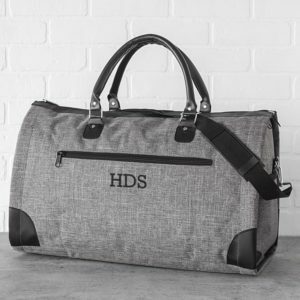 Great for business, pleasure and wedding travelers. Scroll down to see video of the bag in action. Free Personalization: We’ll embroider the Jetsetter’s front pocket with the recipient’s initials in white thread for no additional cost! 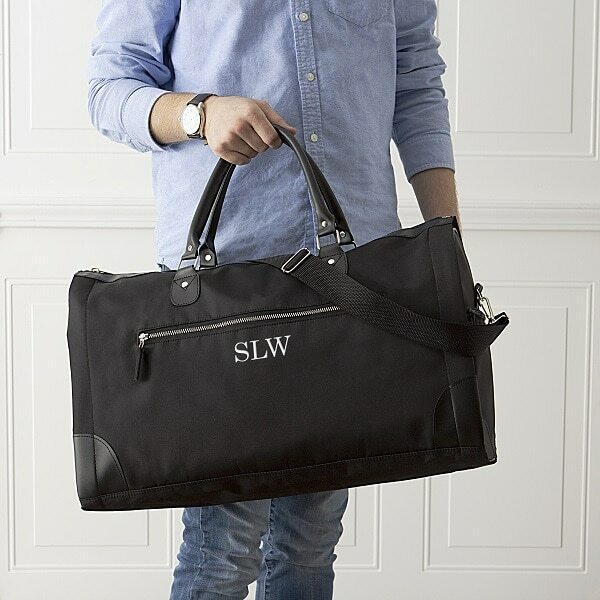 Your clever groomsmen deserve a gift as smart as they are, and The Jetsetter fits the bill. This men’s convertible garment duffle bag is built from a sleek microfiber material. It features dapper faux leather accents and a striped interior. 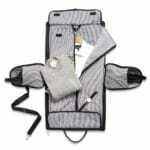 This handy gift also includes a hanging loop and adjustable shoulder strap for easy carrying on trips. 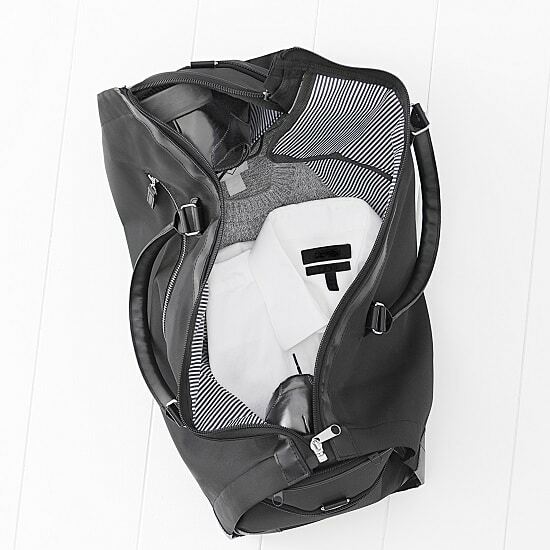 The duffle converts into a full garment bag in no time at all, making this dual purpose item convenient as it is handsome! Speaking of convenience, do you like pockets? Because boy do we have pockets: 3 outer zippered pockets, 1 inside zippered garment pocket, and two instead open side pockets for shoes. We will even personalize the front pocket with up to three initials in a variety of thread colors, all at no additional cost to you. Don’t forget there’s a version for her too! Faux leather & microfiber construction with striped lining. 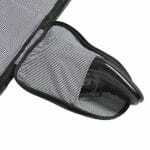 Hanging loop with detachable claw clasp. 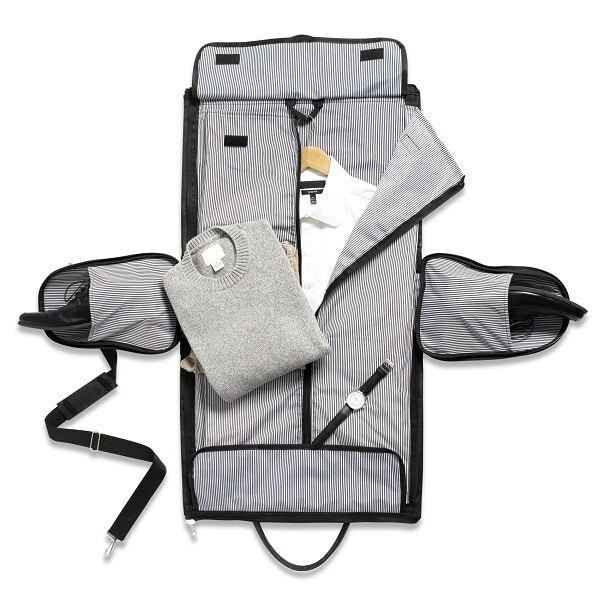 Closed garment bag: 20.75” L x 9" W x 12" H.
Outer side zippered pockets: 7.25" L x 8" W.
Front zippered pockets: 7" L x 13" W.
Handles: 16" L x 1" W.
Adjustable shoulder strap: 50.5" L x 1.5" W.
Open garment bag: 35.75" L x 44.875" W.
Inside open side pocket: 7" L x 8.25" W.
Inside zippered garment pocket: 34" L x 18.75" W x 1.75" H.
Is the Jetsetter easy to clean? Yes. Simply spot clean with warm water and light dish detergent. Air dry.